A skid steer loader is a valuable piece of equipment used in agricultural, manufacturing, construction and landscaping industries. The lifting capacity of the compact tractor provides many opportunities for performing a variety of tasks to meet the needs of the owner and operator. With the proper attachments, the loader can be uses a forklift, front end loader, bulldozer, grader or other tool. 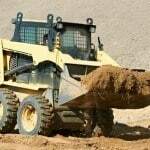 Most commonly, the skid steer loader is equipped with a wide bucket that can lift and transport large amounts of gravel, sand or dirt to be deposited elsewhere. However, because of their agility and ability to maneuver in tight places on different surface levels, skid steer loader accidents are all too common. Statistics maintained by the National Safety Council indicate that operating a skid steer loader continues to be a high-risk occupation. The features on a skid steer loader expose operators to substantial risks. One feature independently locks the wheels to allow the equipment to turn quickly in tight confined spaces. While this feature is advantageous, it places the operator and equipment at risk of a rollover. In addition, diesel engines power most steer skid loaders, making them noisy and hazardous to respiratory health because of the toxic exhaust fumes they emit. Rosenfeld Injury Lawyers LLC are experienced in handling product liability in personal injury cases involving skid steer loader accidents. Our experienced farm accident attorneys specialize in wrongful death and catastrophic injury claims. Our law firm represents injured workers suffering loss of limbs, broken bones, back injuries, disabling neck injury, head trauma, TBI’s (traumatic brain injuries) and death. Our lawyers seek financial damages from property owners, contractors, subcontractors and other third parties including industrial equipment and parts manufacturers. We prepare all of our cases for trial by consulting experts, assembling evidence and interviewing witnesses. It is our firm belief that every individual at fault for a skid steer loader related injury needs to be held legally accountable. If you, or a loved one, are suffering injuries from an industrial, agricultural or construction site accident, we encourage you to call our law offices at (888) 424-5757 to schedule your free, no obligation consultation today.